At its annual pre-Detroit auto show breakfast last week, Cox Automotive analysts were bullish about the prospects of vehicle subscription services in 2019. 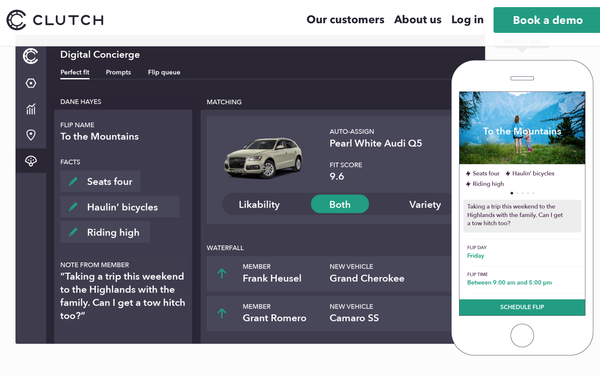 The company has its own subscription technology platform, Clutch, and has also invested in Getaround, a consumer car-sharing platform that empowers users to instantly rent and drive cars shared by people in their city. Research by Cox shows consumer attitudes about the necessity of vehicle ownership are gradually changing, with 39% of respondents saying access to mobility is necessary, but owning a vehicle is not, a 5% increase since 2015. For urban consumers, 57% indicate access to mobility is more important than vehicle ownership, a 13% increase since 2015. This means increasingly more consumers are prioritizing technology solutions that provide easy mobility over traditional vehicle ownership. Gen Z and millennials are the most open to adopting alternative modes of transportation, says Isabelle Helms, Cox Automotive vice president of research and market intelligence, who adds that affordability increases consideration of mobility alternatives since owning and leasing are becoming too expensive for some consumers, particularly younger ones. But how long will it take to be offered nationwide and at an affordable rate? Currently, it seems only luxury brands can offer such a subscription option, since the cost to consumers has to be upwards of $1,500 a month for automakers to make any money, due to what it costs automakers to maintain and insure a fleet of vehicles, according to Hyundai CMO Dean Evans. And who wants to pay $1,500 a month for a non-luxury car, even with the prospect of insurance included and the option to switch out models? Cars.com priced 10 car subscription plans from five programs — Access by BMW, the now defunct Book by Cadillac, Care by Volvo, Mercedes-Benz Collection and Porsche Passport — against the cost to lease, insure, maintain and pay associated taxes and fees on typical cars in those respective plans. Cars.com found that besides Care by Volvo, which starts at $650 a month, subscription programs run anywhere from 28% to 102% more per month than the equivalent cost to lease, insure and maintain a typical car therein — and that doesn't even account for the onetime fees to join such subscription plans, which range from $495 to $575. Cadillac CMO Deborah Wahl tells MediaPost the luxury automaker plans to bring back its currently shuttered Book by Cadillac in the second quarter. She wasn’t ready to offer a lot of details about how Book 2.0 would work or what the price would be. But Cadillac President Steve Carlisle told GMAuthority.com that in its first iteration, which cost $1,800 a month, subscribers weren’t swapping into different vehicles, which has led Cadillac to rethink how it approaches such a service. The $1,800 a month was a good deal for customers who primarily wanted the Escalade, Wahl points out. Lexus vice president Cooper Ericksen points out that different automakers might have different concepts of what “subscription” even means. Lexus is preparing to launch in February its Lexus Complete Lease for the UX model only in major metro markets in seven states. The program will offer two-year agreements with a 20,000-mile limit for one nonnegotiable price tag that includes the lease payment, car insurance, maintenance including tires and wheels, and all connected services such as WiFi and satellite radio. The price will vary depending on the market because of differing insurance rates, Ericksen says. Hyundai’s Evans says another factor is that dealers don’t want all the capital outlay of having to maintain a fleet of subscription cars and would rather sell the vehicles outright. He says that while a subscription model might sound attractive in theory, most consumers actually don’t want the hassle of switching their belongings from one car to another.